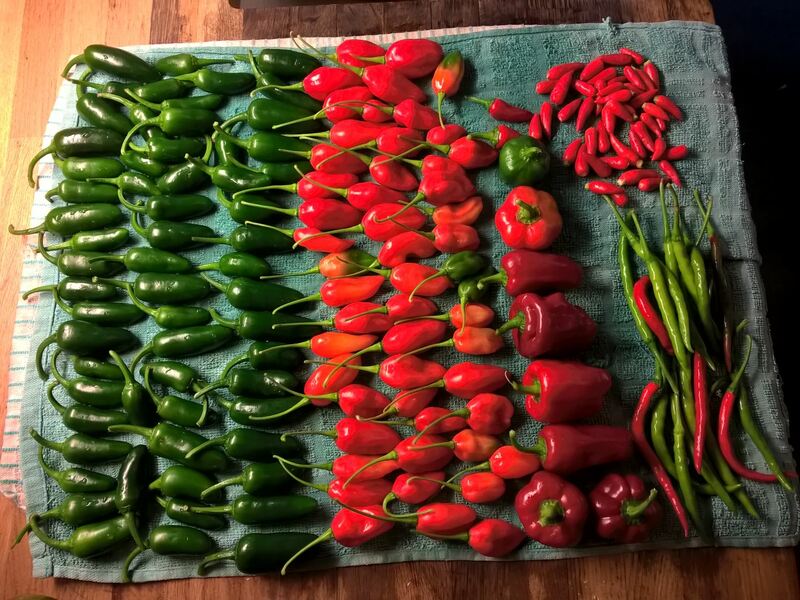 All I seem to be posting about at the moment is making chilli pickles but I can announce with conviction that this is the last pickling post for this year because today I cleared the last of the pods from my plants and cut healthiest of the plants back to a few inches tall in the hope that they will successfully overwinter. 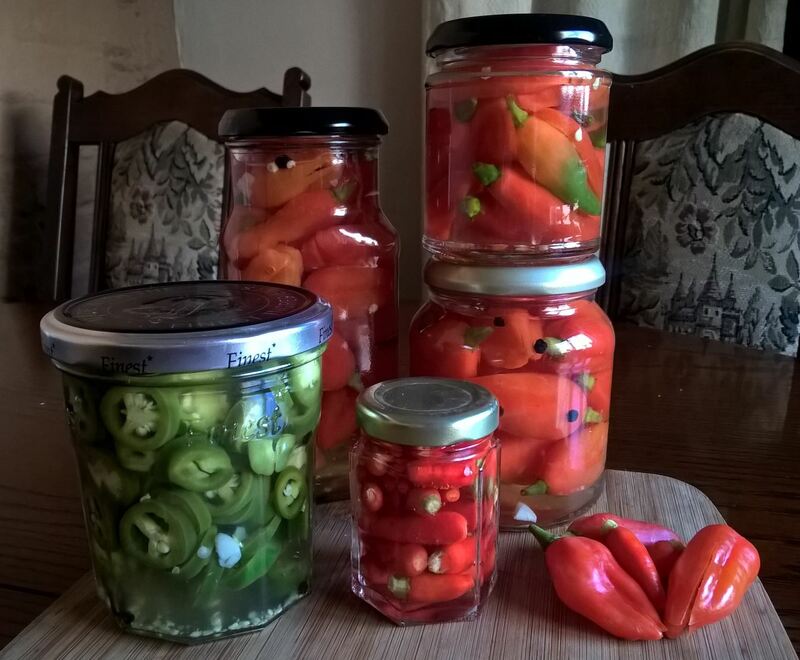 With my chillies washed and drying, I gathered my ingredients for making the pickling liquor and washed and dried the jars I needed. And just because they look so beautiful, here is another view of them. I opted to slice the Jalapenos into rings. 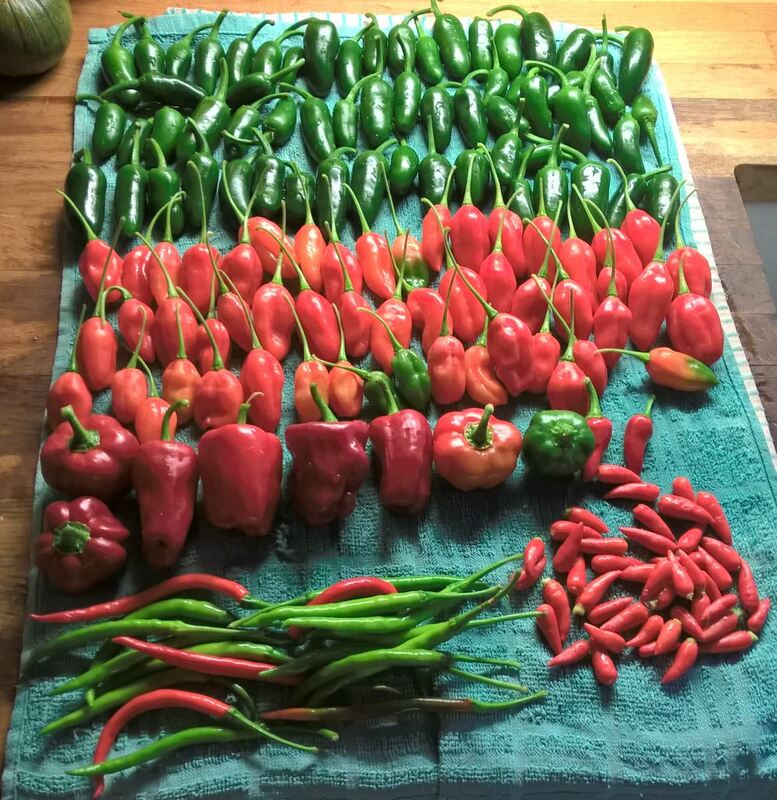 My final crop total this season for this variety was just over 1.4kg of chillies (minus their stalk ends) which is a pretty decent haul and has made enough pickled and frozen Jalapeno rings to last Mud well into next year. The frozen ones will be handy to add into chillies, pizzas and chicken fajitas over the next year and Mud has already utilised the first couple of jars from the first batch of pickles and has declared them more than satisfactory, better than the shop bought ones. The Paper Lanterns were next to be prepped for pickling and after reading up about them, I decided the best way to pickle these was to leave them whole but, to ensure that as little air remained trapped in the pods as possible during the pickling process, I sliced each pod, lengthwise in three places. I trimmed the stems down to the thick end of the stalk and packed them as tightly as I could into three jars. For the pickling liquor I put 350ml of cider vinegar, 100ml of white wine vinegar and 450ml of water into a pan, together with a tablespoon of salt and a half teaspoon of sugar. I set the pan on a low heat until the sugar and salt had dissolved, before allowing it to come to the boil for 5 minutes. I added sliced garlic and black peppercorns into each jar and then poured the hot vinegar mix onto the chillies. I tapped each of the jars on the kitchen side to try and dislodge as much trapped air as possible and then fastened the lids in place. As it happens I still had a small jar and some of the vinegar mixture left, so I popped the handful of Patio Chillies I had picked into the jar and covered them with the remaining vinegar mixture. So there you have it, I’m all Chillied out. There are 4 jars of Jalapenos in the cupboard (and most of another in the fridge), along with 2 jars of mixed chillies, 3 jars of Paper Lanterns and a small jar of pickled Patio Sizzlers, as well as 3 food bags of Curry Chillies AND 2 food bags of sliced Jalapenos in the freezer. 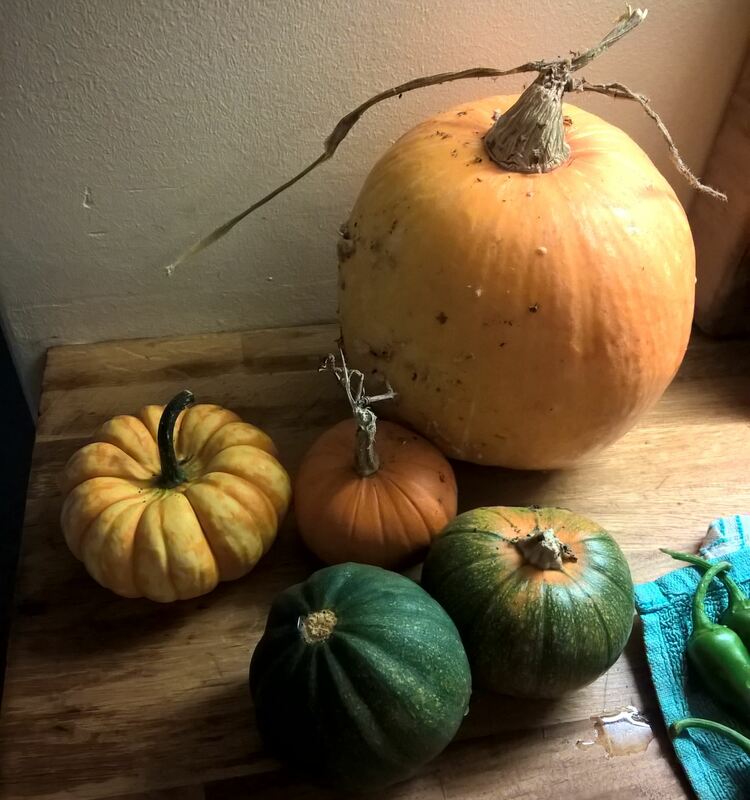 And changing the subject completely, the pumpkins and squashes haven’t done so well this year but we have managed to produce one football sized pumpkin, a small orange one, a small green one as well as two winter squash….. and any growing year in Mudville where we manage to produce a pumpkin big enough to carve, is a success in my book!